Depending on the source you chose to rely on, it is Japan’s oldest martial art; I’m using the word “martial” in its literal sense here since, until 1543 and the introduction of firearms the bow (and not the sword as many believe) was the main weapon of warriors on the battlefield. In the early 12th century the Kamakura shogun Minamoto no Yoritomo added a ritualistic aspect dedicating it to Hachiman, god of war and patron deity of his family and since 1728, when it was fully revived by the eighth Tokugawa shogun, Yoshimune, it remains one of the most exiting cultural and religious events in Japan. Depending on the period it has been called by different names, but the one that stuck and is still used (albeit somewhat reluctantly) by both schools that continue practicing it, Ogasawara Ryu (小笠原流) and Takeda Ryu (武田流) is “yabusame” (流鏑馬), “horseback archery”. Although it is connected to warriors (and actual warriors at that; not the bureaucrat-samurai of Edo) the attire worn by today’s yabusame archers does not involve armors and helmets but the official hunting clothing of the Kamakura period (1185-1333): wide-brim straw hats, brightly colored jackets, gold-embroidered enormous hakama pantaloons and short boots –of course the swords are still there but only as a decoration. And their impressive appearance often distracts the viewer from the fact that what they are asked to do is really difficult: from the moment the flag (or in their case, the fan) drops they must take from their quiver three arrows and shoot them while controlling their galloping horse only with their knees. And because this is a Japanese event, all this must happen in a very particular way and following a very specific model and very exact set of very strict rules. It is hard to attend a yabusame ritual-contest and not get carried away. 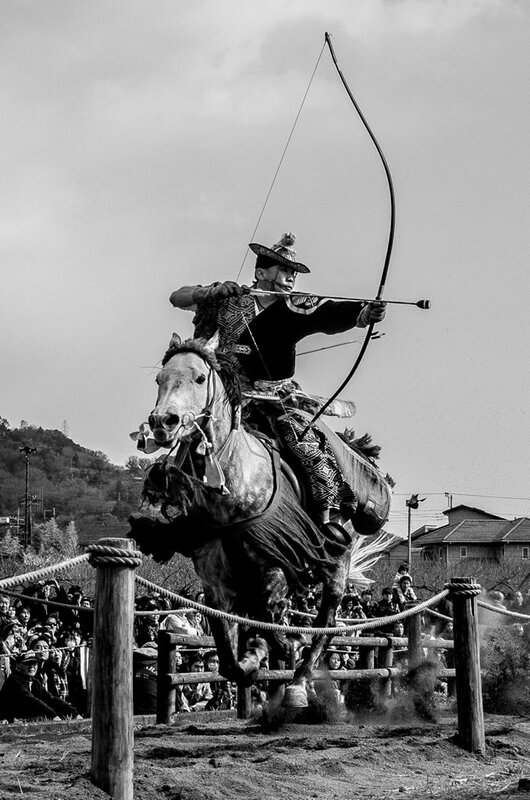 Like in sumo, although every shot doesn’t last more than a few seconds, the combination of sounds (the galloping and the snorting of the horse, the twang of the bowstring, the thud of the arrow) and images (the expressionless face of the archer, his spectacular clothes, the controlled madness of the temporarily deranged animal) with the actual success or failure (the archer will either hit the targets or not) makes you involved, concerned and really wishing for everyone to succeed –I have never seen the viewers rooting for just one rider and taking joy with the others’ failure. Whether in Kamakura as a tribute to Yoritomo’s memory with the Tsurugaoka Hachimangu Shinto shrine as background, in Asakusa, by the river and the Sky Tree or in Meiji Jingu’s huge park in Harajuku to honor the great reformer emperor, yabusame is a cosmic vortex drawing you in and transporting you to another epoch.